The default view is that the images and products are hidden. Google is constantly experimenting with new features, tools and visual representations to improve the user experience and usefulness of our ads. As part of that effort, we’re currently running a test in which images of specific products offered by an advertiser may appear within some text ads on Google search results pages. This experiment helps users quickly find the products they’re looking for, and offers advertisers a new way to engage potential customers. This feature is currently in a limited beta and only visible to a small number of users on shopping-related queries. In any event, here is some history on Google testing the ad formats. 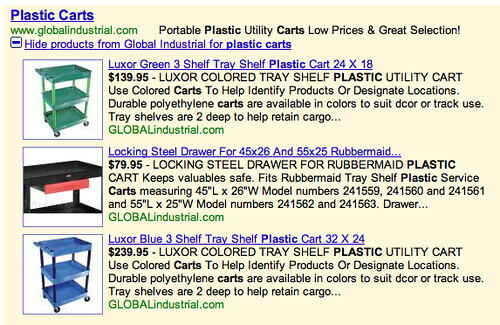 Recently, Google started testing Sitelinks in ads and earlier this month we saw a single product image opened. Back in November 2007, we first spotted reports of this and then again in January 2008. 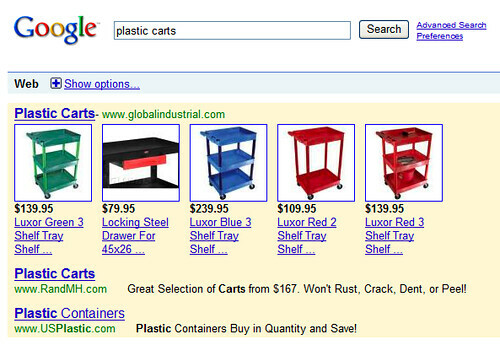 Then in October 2008 we had pictures of products in AdWords ads, which became the real-deal in February 2009. The feature was powered by Google Base linkage with AdWords. Forum discussion at the Search Engine Roundtable Forums. Previous story: Should You Flaunt Your Search Engine Rankings?